Before anything else, let’s talk about why your Rottweiler is doing what it is doing. Obviously, dogs aren’t rational creatures and therefore it isn’t chewing up random objects in your home just to spite you or make you upset. It’s important for you to understand that all dogs in general and not just Rottweilers, are naturally inquisitive. They love to explore their environment and they do this by engaging their senses: from their sense of sight to their sense of smell, sense of touch and of course, their sense of taste. Which is why many objects end up in their mouths. This particularly applies to puppies. Puppies enter the teething process for around six months and this makes them extremely uncomfortable during this period. That said, chewing helps them to deal with this discomfort and soothes their gums. It wasn’t properly trained as a puppy on what is appropriate to chew in the home and what is off limits. If your Rottweiler didn’t grow up with you and you are unsure about its background or history, this could be the culprit. You can always attempt to train your Rottweiler now or hire a dog whisperer or behavioural specialist. It isn’t being provided with sufficient stimulation and thus it is creating ways to keep itself amused. In other words, it is bored. In this case you can interact with it more often, provide it with a companion, or purchase more toys for it. For Rottweilers though, increased physical activity is always a good idea. It is afraid of something. Did anything change in your Rottweiler’s environment? Does it have a new companion? Does the noise level in your home increase at certain hours of the day or evening? 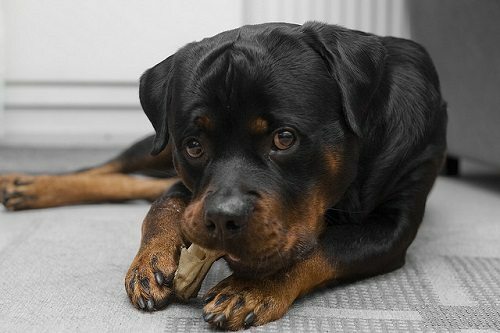 All of these could be possible triggers for destructive chewing behaviour in your Rottweiler. It is seeking attention. Do you give sufficient attention to your pet Rottweiler? Or does it have to beg you for it? If this is the case, this could be why it is chewing objects in your home incessantly. As you try to figure out the reason why your Rottweiler is acting the way that it is, take responsibility for your things. Hide objects that are unsafe for your pooch to access or that you don’t want to risk getting destroyed. If your dog is new to your home and just being housebroken, you may wish to leave it in its crate until it becomes 100 percent familiar and compliant with the house rules. Allow it to interact with people for extended periods of time as well so that unfavourable behaviours can be curbed and corrected. After all, if you leave your Rottweiler out in the yard all day, who’s going to correct it when it does something inappropriate? 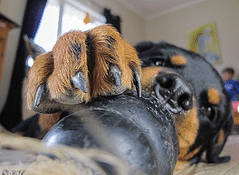 Whether your pet Rottweiler has been engaging in destructive chewing behaviour for quite some time or you are relatively new to this frustrating experience, you have come to the right place. Here we tell you what measures you can implement in order to curb this unwanted behaviour that has the potential to lead to catastrophic consequences if left unaddressed. First, it might be your shoes. Then, next thing you know it will be your socks, your sofa, or worse, something that could be potentially dangerous to your Rottweiler. This is what you want to avoid above all, albeit chewing should be discouraged from a general standpoint. Stay calm. Going berserk and attacking your dog or yelling at it in frustration will not help the problem at all. By the time the damage is done, your dog will no longer recall what it is being reprimanded for. Worse, the fear that results from getting yelled at may just serve to rattle your dog and lead it to chew on another object to quell its emotions. Correct your Rottweiler. Correcting your dog doesn’t mean grabbing the chewed up object from its mouth or physically separating it from the object. Instead, touch your Rottweiler lightly either on its behind or neck to turn its focus elsewhere. Refocus your Rottweiler’s attention. 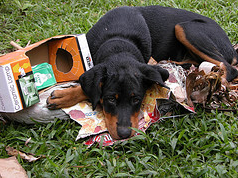 If your Rottweiler refuses to turn its attention away from the object, look for something else that will steal it. Perhaps this can be a treat or a different toy. Reclaim the object. Channel your energy and gear your body language towards letting your dog know that the object is not his, but rather it is yours. This will help your dog release its hold on the object knowing that somebody else has marked the territory, so to speak. Purchase safe chew toys. In some cases, what a Rottweiler might need is simply some chew toys or objects that it can call its own. Additionally, what some pet owners might view as destructive or aggressive behaviour is actually a form of self-soothing for your Rottweiler. As touched on earlier, dogs actually like to use chewing as a means to relax themselves. Puppies in particular use chewing as a method of pain relief. That being said, purchase safe chew toys at your local pet store, veterinarian, or groomer’s. Get defensive in your approach. What does this mean? This means implementing measures that will deliberately make chewing a displeasurable experience for your Rottweiler. For instance, coat furniture and other items that you want it to stay away from with a taste deterrent. These are available at most pet stores and the veterinarian’s office. No matter what you use, be sure it is non-toxic to your pet. If you find that your Rottweiler only chews objects when you are not home, this may be a case of separation anxiety. Visit a veterinarian as soon as possible for professional advice.